Hereditary spastic paraplegias (HSPs) are a group of neurodegenerative diseases characterized by progressive spasticity and weakness of the lower limbs. SPG4, SPG3A and SPG31 are the three leading causes of autosomal dominant (AD) HSPs. A total of 20 unrelated AD-HSP families were recruited for clinical and genetic assessment. Detection of mutations in SPG4, SPG3A and SPG31 genes was conducted according to a standard protocol. Genotype-phenotype correlations and determinants for disease severity and progression were analyzed. Mutations in the SPG4 gene (SPAST) were detected in 18 (90%) of the AD-HSP families. Mutations in SPG4, SPG3A and SPG31 genes were not detected in the remaining two families. Considerable variations in clinical features were noted, even for mutation carriers from the same family. Mutations causing complete loss of the spastin AAA cassette were associated with earlier onset of disease (20 ± 18 years) compared with those with preservation of partial or total AAA cassette (32 ± 19 years, p = 0.041). For those with SPG4 mutations, disease severity was related to the patients’ current age, and the progression rate of disease was positively correlated with age at onset. SPG4 accounts for most of the AD-HSP cases in Taiwanese, with a frequency significantly higher than in other populations. SPAST mutations which predict complete loss of the spastin AAA cassette were associated with an earlier onset of disease. Hereditary spastic paraplegias (HSPs) are a heterogeneous group of neurodegenerative disorders clinically characterized by progressive spasticity and weakness of the lower limbs . They can be classified according to the mode of inheritance, or by the absence (“pure form”) or presence (“complicated form”) of additional neurological or systemic manifestations such as dementia, epilepsy, mental retardation, thin corpus callosum, cerebellar ataxia, peripheral neuropathy, deafness, retinopathy, and optic atrophy ,. Pure forms of HSPs are usually inherited as an autosomal dominant trait, whereas most complicated HSPs are autosomal recessive forms. To date, more than 70 loci for HSPs have been mapped and at least 55 genes have been identified . Autosomal dominant HSPs (AD-HSPs) represent around 70% of cases of uncomplicated HSPs . SPG4 is the most common form of AD-HSP, accounting for around 40% of the families in previous reports ,. Spastin, the protein encoded by the SPG4 gene, is a member of the family of AAA proteins (ATPase associated with diverse cellular activities) which share a common functional domain called the AAA cassette . SPG3A is the second most frequent form of AD-HSP, representing approximately 7-10% of all AD-HSP families ,. The SPG3A gene encodes the protein atlastin-1 which is structurally homologous to members in the dynamin superfamily of GTPases . SPG31 has been suggested to be the third most common cause of AD-HSP, with an overall frequency of 2.3-6.5% in the kindreds of primarily European descent ,. The SPG31 gene encodes receptor expression-enhancing protein 1 which may be involved in a chaperone-like function . We previously reported four Taiwanese families with SPG4-related HSP . In this study, we extended the scope of the investigation to screen SPG4, SPG3A and SPG31 in additional AD-HSP families. The results showed an unexpectedly high frequency of SPG4 in the cohort of Taiwanese AD-HSP families. The study protocol was approved by the Chang Gung Memorial Hospital Institutional Review Board (No. 100-4460C). Clinical and genetic features of the participants were examined after written informed consent had been obtained from participants or a parent while participants were children. This study included 20 unrelated AD-HSP kindreds (49 cases in total) of Han Taiwanese ethnicity collected from the Departments of Neurology, Rehabilitation and Pediatric, Chang Gung Memorial Hospitals, Taiwan (Additional file 1: Figure S1). Families 1 to 4 have been reported previously . A diagnosis of AD-HSP was based on the following diagnostic criteria: (1) spastic paraplegia, or (2) spastic tetraparesis with earlier and more severe affliction of the lower limbs, or (3) spastic paraplegia as an early and prominent sign of a degenerative disease affecting the nervous system; (4) positive family history of spastic paraplegia with affected members in at least two generations; and (5) no other causes of the presenting symptoms . Family history was recorded according to the patients' reports, and inheritance was ascertained in 14 families by examining affected family members. Clinical information was collected and neurological examinations were performed. Ambulatory disability was scored based on a five-point scale: 0 asymptomatic, 1 minimally impaired (able to run), 2 mildly impaired (able to walk independently but not run), 3 moderately impaired (walk with an aid), and 4 severely impaired (wheelchair bound). Genomic DNA was extracted from peripheral blood leukocytes for genetic analysis, and mutation screenings were conducted in the following order. First, nucleotide substitutions and small deletions or insertions in all exons and their adjacent splicing sites of the SPG4 gene (SPAST) were analyzed by polymerase chain reactions and direct sequencing. If a mutation was not detected, multiplex ligation-dependent probe amplification (MLPA) was performed to detect exonic deletions in SPAST. Finally, for the cases with no detected mutations in SPAST, sequence analysis and MLPA of the SPG3A gene (ATL1) and sequence analysis of the SPG31 gene (REEP1) were performed. Detected mutations were checked in 100 control DNA samples collected from unrelated ethnic Han Taiwanese. MLPA was performed using SALSA MLPA kits (P165-B1 HSP probemix; MRC-Holland, Amsterdam, Netherlands) according to the manufacturer's instructions. For each sample, a normalized value ratio for a relative peak area between 0.8 and 1.2 was considered normal. A heterozygous deletion was expected with a ratio between 0.3 and 0.7, and a heterozygous duplication between 1.3 and 1.7. Total mRNA from the blood leukocytes was extracted using Trizol procedure (Invitrogen, Carlsbad, CA, United States). mRNA analysis was performed as described previously  to assess alternations in gene transcription due to SPAST mutations. Novelty of a detected mutation was checked with the Human Gene Mutation Database . Amino acid conservation in orthologues was assessed using the HomoloGene database . Prediction of pathogenicity of a missense mutation was analysed using the PolyPhen-2 program . Data were presented as mean ± SD unless otherwise specified. Disease severity was defined as “mild” with an ambulation score of 1 or 2, or “severe” with a score of 3 or 4. The progression rate of the disease was assessed with a disease-progression score (DPS) calculated as the current disability score divided by disease duration. Mutations were classified according to the consequence, namely, whether they caused a complete loss of the AAA cassette (i.e. nonsense and frameshift mutations proximal to the encoding sequence of the AAA cassette, whole gene deletion, and mRNA decay) or not. Age at onset (AAO) with respect to mutation consequence was tested with t-tests (asymptomatic cases were excluded from the analysis). The relationships between disease severity and current age, gender, disease duration and mutation consequence were tested using the chi-square test or t-test. The relationships between DPS and AAO, gender and mutation consequence were tested using the Pearson test or t-test. Independence of the association between disease severity (or DPS) and clinical and genetic factors was examined using logistic (or linear) regression analysis. A p value <0.05 was considered to be statistically significant. A total of 14 different SPAST mutations were identified in 18 families (Table 1). In this cohort, SPG4 accounted for 90% of the AD-HSP families. Mutation types were quite heterogeneous, including nonsense (2), missense (2), insertion (2), deletion (2), insertion-deletion (1), splicing site (2), and large exonic deletion (3) (Figure 1). Four mutations (c.1361_1363 ins GGG, c.1005-1 G > C, c.1004 + 1 G > T, and c.1738_1740 del ATT/ins GA) were novel mutations. These mutations were neither included in the data derived from the 1000 Genome Project (http://www.1000genomes.org/)  nor detected in the 100 control DNA samples. The residue leucine affected by the missense mutation p.L461P and the residue aspartate affected by D555G were highly evolutionarily conserved according to the public genome database (Additional file 2: Figure S2). The substitutions of amino acids caused by the two missense mutations were predicted to be damaging (a score of 1.000 and 0.988 respectively) by the PolyPhen-2 program. In general, nonsense and missense mutations were located in the 3′ half of SPAST exons, while frameshift (mini-insertions and mini-deletions) and splicing site mutations were more evenly distributed in the gene. Co-segregation of mutations with the disease was confirmed in 14 families, in which at least two affected members underwent genetic testing. Mutations in SPAST, ATL1 and REEP1 were not detected in two families (Families 14 and 19). Abbreviations: DPS disease progression score, F female, M male. †0, asymptomatic; 1, able to run; 2, unable to run, walking independently; 3, walking with an aid; 4, wheelchair bound. SPAST mutations detected in the current study. Schematic representation of the location of SPAST mutations detected in this study. Numbered boxes indicate transcript coding regions in exons drawn to scale. Encoding region of the AAA cassette is highlighted. For the in-frame insertion c.1361_1363 ins GGG detected in Family 6, only the wild type of mRNA was detected in mRNA analysis and the decay of mutant mRNA is suspected (Additional file 3: Figure S3). For the other insertions and mutations of missense, nonsense, and deletion types, mRNA analysis showed nucleotide changes identical to those in genomic DNA. The two splicing site mutations in intron 6 led to skipping of transcription of the first 8 bases of exon 7 (Family 9) and the whole of exon 6 (Family 10), respectively. For the exonic deletion revealed by MLPA in Family 2, cDNA analysis showed a deletion of 1090 bases at the 5′-end of exon 17, as reported previously . In Family 4, the effects of complete loss of exon 17 on translation could not be determined due to failure to amplify the mutant transcript. In this AD-HSP cohort, AAO in the probands ranged from 1 to 48 years, and six (30%) families had at least one case whose AAO was less than 10 years. The clinical characteristics of the SPG4 cases are summarized in Table 2. The onset of disease ranged from 1 to 69 years of age. Among the 47 cases carrying SPAST mutations, 44 (94%) showed spastic paraparesis and 3 (6%) were asymptomatic. All of the symptomatic SPG4 patients manifested a pure phenotype, except for a case in Family 7 who presented with distal amyotrophy in the upper limbs. The most common clinical presentation was gait disorder due to spasticity or increased tendon reflexes in the lower limbs. Neurological examinations of the cranial nerves and upper limbs were normal except for an accentuated jaw-jerk and tendon reflex in some patients. Considerable variations in AAO, rate of progression or severity of disease were noted, even in mutation carriers from the same family (Table 1). There was no clear phenotype correlation with respect to the different types of mutations. For the two families without detected mutations, one had a pure phenotype while the other presented with deafness in the affected members. †urinary retention, frequency or incontinence. ‡0, asymptomatic; 1, able to run; 2, unable to run, walking independently; 3, walking with an aid; 4, wheelchair bound. 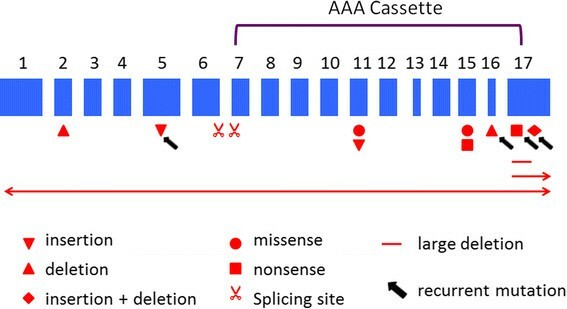 For the SPG4 cases, mutations causing complete loss of the AAA cassette were associated with an earlier onset of disease (20 ± 18 years, n =16) compared with those with preservation of partial or total AAA cassette (32 ± 19 years, n = 28; p = 0.041). In univariate analysis, disease severity was related with the patients’ current age (37 ± 19 years for mild disease vs. 55 ± 12 years for severe disease, p <0.001), and DPS was correlated with AAO (r = 0.564, p <0.001) (Additional file 4: Table S1 and Additional file 5: Table S2). After adjusting for gender, disease duration and consequence of mutation, the association of age (odds ratio 1.10, 95% confidence interval 1.04-1.16 for every increase of 1 year, p = 0.002) with disease severity, and that of AAO (β = 0.038, standard error 0.010, p <0.001) with DPS remained significant. Consequence of SPAST mutation was not related with either disease severity or DPS. Compared to previous series in other populations, the current findings showed a significantly higher frequency of SPG4 for AD-HSP in our ethnically Han Taiwanese cohort (90% vs. 30-60%; Additional file 6: Table S3). Previously, a study of HSP cohort in Sardinia, Italy showed that SPG4 was responsible for all of nine AD-HSP families receiving genetic test . However, eight of these SPG4 families were attributable to a same multi-exonic deletion in SPAST, suggesting a founder effect for this mutation in this population. In contrast, the predominance of SPG4 in our cohort could not be due to specific founder mutations because most of the detected mutations were unique to the respective families. Although 7-10% of AD-HSPs are known to be caused by SPG3A, none of our cases had ATL1 mutations. SPG3A is characterized by early onset of disease, usually before 10 years of age . Failure to detect SPG3A in this study due to ascertainment bias is unlikely in view of the wide range of AAO (1–48 years) in the probands and the inclusion of pediatric cases in this cohort. A possible explanation for this phenomenon may be ethnic differences in the genetic background. However, because of the relatively small kindred number in the present study, this finding needs to be confirmed with a larger cohort of AD-HSP families. The current study showed that missense mutations were located in the AAA cassette-encoding region, while frameshift mutations which create premature termination codons were scattered along the SPAST gene (Figure 1). In spite of the heterogeneity in mutation types, all of these mutations may either alter the structure or disrupt the integrity of the AAA cassette. Further, most of these mutations were predicted to produce a truncated spastin or absence of mRNA transcription. This finding suggests that haploinsufficiency due to the abolishment of ATPase activity is the most important pathogenicity for disease-causing SPAST mutations. For SPG4, mutations causing a complete loss of the spastin AAA cassette were associated with earlier onset of disease than those with at least partial AAA cassette preservation. However, further studies of the production of truncated spastin proteins by the mutations predicting partial AAA loss and function of spastin protein carrying partial AAA cassette in cellular levels will be needed to provide biological evidence for this finding. Except for the common motor dysfunction due to spastic paraparesis, remarkable variations in onset age, progression rate and disease severity were noted in the SPG4 patients, even for those from the same family. We also found that later onset of the disease was associated with faster disease progression. This finding is consistent with Harding’s observation on the pure form AD-HSP  and has also been noted in previous studies in SPG4 ,. In addition, the patient’s current age was the most significant determinant for disease severity. Taken together, these findings suggest that the SPG4 phenotype is the product of interactions between SPAST mutations and environmental or other genetic factors. There are some limitations to this study. First, this study was based on a relatively small cohort of AD-HSP kindreds collected from two medical centers in Taiwan. Our findings need to be confirmed by a more extensive nationwide survey of AD-HSP families. Second, this is a cross-sectional study, and disease progression would be more accurately evaluated by a longitudinal observation. Third, the five-graded ambulation score did not have enough sensitivity in detecting minor differences in disease severity. A more detailed assessment scale, such as Spastic Paraplegia Rating Scale , would be better in reflecting overall functional impairment. Fourth, because the age of symptom onset was determined according to patient reports, there could be errors in recalling the information, especially for those with long-lasting disease. Finally, this study did not test the genetic modifiers, such as some sequence variants in ATL1 and HSPD1, which have been postulated to account for the variability in SPG4 phenotypes . SPG4 accounted for a significantly higher proportion of AD-HSPs in ethnic Taiwanese than in other populations. There was no clear genotype-phenotype correlation among the SPG4 patients, except that mutations resulting in complete loss of the spastin AAA cassette were associated with an earlier onset of disease. MYL: project conception and design, clinical and genetic data collection and analysis, statistical analysis, writing of the first draft. YYC: project conception and design, clinical data collection and analysis, statistical analysis. THY: genetic analysis, organization of the study, manuscript review and critique. SCL: genetic analysis, organization of the study. CWL, HCK, YRW, RKL, JWH, YCC: clinical data collection and analysis. CSL: project conception and design, organization of the study, manuscript review and critique. All authors read and approved the final manuscript. We are grateful to all the families with hereditary spastic paraplegia who contributed to this research project. We are also in debt to grants CMRPG 3D0371 (to Dr. Lu), CMRPG 3D0381 (to Dr. Yeh), and CMRPD 1B0331 (to the Healthy Aging Research Center).